The Washington Capitals have given up the first goal in 12 of their last 15 games. They’ve lost three of those games, took a loser point from one, and won the rest. On Monday night, they added another to the win column beating the Arizona Coyotes 3-2 for their fourth consecutive win. The Capitals are the first team in NHL history to win 44 games through 58 games. Leading the Caps in “almost but not quite goals” and “he has to score soon right?” Mike Richards finally broke his 27-game scoreless streak and netted his very first goal as a Cap. After numerous shots, including a nifty breakaway short-hander that he took end to end with some dazzling stick work, it was a dirty grinder goal from a rebound off Coyotes netminder Louis Domingue that finally gave the blue collar player his due. In Arizona, Jay Beagle got one, and Eric Fehr got the biggest fish in overtime for the win. Two points, and the Capitals are off to Colorado. This season has been weird for Fehr, from playing on the first line to being a healthy scratch. Trotz trusted Fehr enough to keep him on the ice during 4-on-4 overtime, and his confidence paid off with an OTGWG. Fehr only played 10:21, so bonus points for efficiency. Holtby seems to be coming out of the rough patch he’s been in of late. He was instrumental in the Caps’ 2-1 win, and stopped 23 of 24 shots for a SV% of .958. He’s the difference between the games the Caps should have won and the games they are winning. Wilson should be commended for his physical play in Arizona. He threw some heavy hits, but it is worth noting that he kept his nose clean and didn’t engage in any extracurriculars. He’s a talented forward and should focus his efforts there. He finished the night with 6 hits, 2 SOG, and 13:55 TOI. The Washington Capitals needed an extra inning to decide their game against the Arizona Coyotes, where Eric Fehr scored the winning goal. Caps win 2-1. After a rough weekend with losses to St. Louis and New Jersey, the win was a good bounce back from two straight losses. With the victory, the Caps now stand in 3rd in the Metropolitan Division with 19 points. Jay Beagle scored his second of the season in the first period, and Oliver Ekman-Larsson evened it up for the Coyotes. In overtime, Fehr netted his third of the season for the game-winner. Braden Holtby stopped 23 of 24 shots for a SV% of .958. Holtby, like his beard, was majestic. He’s finally bouncing back. Evgeny Kuznetsov skated 7:32, the second lowest TOI next to Chris Brown, who skated 6:36. Barry Trotz says he’s trying to find minutes for everybody, but burying Kuznetsov on the fourth line clearly isn’t working. The Capitals had 24 shots on goal, including 4 in OT. They had just 2 SOG in the second period. Shot attempts were tied at 50 for both teams. The Capitals were 0/3 on the PP, but were perfect on the penalty kill, killing all 4 Coyotes power plays. Tom Wilson had another strong showing. He led the team with 6 hits, had 2 shots on goal, and played 13:55. Good look for him. The Colorado Avalanche are up next for the Caps on Thursday at 9 PM eastern time. Since it’s not a back-to-back, expect Holtby to get the start in net. Ride the wave, Trotz, ride the wave. 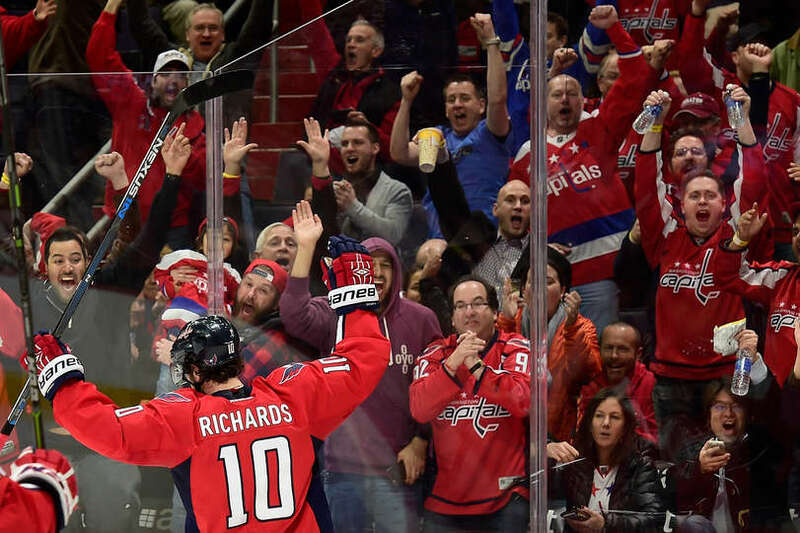 Back from Tampa with a mission, the Washington Capitals knew what they needed to do – win, and they needed to desperately. The Arizona Coyotes, an equally desperate team, seemed like worthy victims. Instead, every Capitals mistake ended up in the back of the net, and the Coyotes rebounded from a 3-1 first period deficit to win 6-5. Nicklas Backstrom was a shining star, quietly earning three assists in the first period, and surpassing Dale Hunter for fourth place on the Capitals’ franchise assists list. Tom Wilson, John Carlson, and Alex Ovechkin’s goals rounded out the first period. Arizona scored five unanswered goals in the win. After quickly scoring three goals and leading by two at first intermission, the Capitals eased off the gas – way off the gas. In fact, it was almost like they stopped driving. A late power play goal by Joel Ward and a tally from Troy Brouwer in the waning seconds of the third narrowed the gap, but that flurry would have been more effective if it had been implemented much earlier. Tom Wilson scored his first goal of the season while skating on a line with Alex Ovechkin and Nicklas Backstrom. Trotz said at the beginning of the season he envisioned an 8-19-43 first line, but that obviously could not come to pass until Wilson returned from injury. Wilson is a talented winger, and it isn’t shocking that he can excel on a line with two world-class players. Sketchy refereeing or not, the Capitals are routinely allowing their opponents too many power plays, and that was no exception against the Coyotes. The Capitals allowed six power plays to the Coyotes, a season high. Tom Wilson took two roughing penalties in the second period, because he wanted to drop the gloves with someone, anyone (no one would oblige a dance). Wilson is quickly going to learn that he is better off doing more constructive things with his ice time than put his team at a disadvantage because of his reckless behavior. Each goal allowed by the Caps was preceded by a sloppy turnover in the defensive zone. Lazy plays are going to end up in the back of the net, and the Capitals learned even a struggling team like the Coyotes can still make them pay. 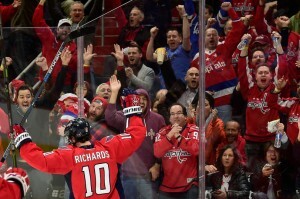 The Capitals have allowed at least four goals in regulation in four consecutive games. That’s not a great stat for a team with an ostensibly better blue line this season. Nick Backstrom’s three assists in first period marked his 27th career 3-assist game. It broke a tie with Sidney Crosby for most in the NHL since ’07-’08. Alex Ovechkin tied Peter Bondra’s franchise points record (825) with his four-point night (1g, 3a). Don’t blame the goaltender. While Barry Trotz said Justin Peters could have made a few more timely saves, he cautioned that the loss should not fall solely on Peters’ shoulders. The other guys on the ice had a little bit to do with it too. The Capitals get a day off Monday before they face the Calgary Flames at home on Tuesday night. The Capitals last won a game on October 26 in Calgary. They are 4-5-2 on the season. It was a good night for the Washington Capitals’ top line, but not the rest of the team. After leading 3-1 at intermission thanks to goals from Tom Wilson, John Carlson and Alex Ovechkin, the Arizona Coyotes battled back and led 6-3 late in the third. A very late power play goal from Joel Ward and an even later even-strength marker from Troy Brouwer got things close, but no cigar. The Capitals lose 6-5, their fourth loss in five games. Lost in the disappointment of yet another loss is that Ovechkin, like Backstrom, also had a four-point night. He scored a power play goal and assisted on one in the first period, and assisted on two goals (Ward, Brouwer) late in the third period. Ovechkin has 11 points on the season (6g, 5a), and his 825 points ties Peter Bondra’s franchise points record. Backstrom earned three assists in the first period alone, passing Dale Hunter in fourth place on the Capitals’ all time assists list. He picked the apples on Tom Wilson, John Carlson and Alex Ovechkin’s goals in the first frame. In his second game back from injury, Wilson skated on the top line, scored a goal on his first shift, and picked up an assist on John Carlson’s first period goal. He would be well-served to learn to keep his hands to himself, but it’s good to see Wilson get ice time with more talented linemates. 8-19-43 is a top line that might stick.